BETTER LOOKING SKIN . . . BUT HOW MUCH BETTER? These days you don’t have to resort to surgery to make some impressive improvements in the appearance and condition of your skin. (That said, sometimes a face or neck lift is the best solution for issues that go deeper than surface problems.) Laser skin treatments can do wonders to improve everything from fine lines and wrinkles to dark spots, acne scars, even hair removal. But which type of skin treatment is right for you? And what can it really do for you? Reviewing before and after photos is one of the best ways to find out. You can see results achieved by real people who have had laser skin treatments similar to whatever you’re considering. The more photos you view, the better you’ll be able to see a range of results. You can get the general idea from almost any photos. However, you’ll get the most realistic picture (and most realistic expectations) by searching out before and after shots of folks who are most like you. That’s because, while we are all different, we do have certain similarities – gender, age, skin color and texture, and of course those pesky skin problems we want to overcome, on our face or elsewhere. You have probably read that lasers may not work so well for you if your skin is dark. Don’t assume that leaves you out, because laser technology has improved significantly in recent years. But do look for before and after photos of patients whose skin tone is similar to yours. And, even if you don’t find any quite like you, remember that a personal consultation is the only way to know for sure what skin treatments could do for you. Laser skin treatments may be far faster and more convenient than surgery, but they are still a serious undertaking. You want to be 100% confident you’ll be treated in a clinic that offers the utmost in safety and comfort. That includes highly trained and medically supervised aestheticians. Lasers use very precise, intense heat or light to perform their work. The results may seem almost magical when you look in the mirror, but it takes considerable skill and experience to use lasers properly and safely. 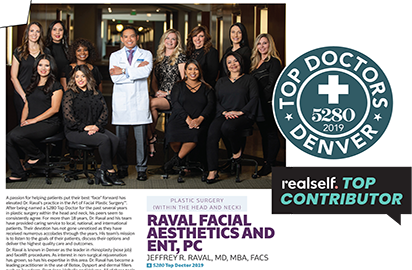 Rocky Mountain Laser Aesthetics and Raval Facial Aesthetics are owned and supervised by Dr. Jeffrey Raval, MD, MBA, FACS. Dr. Raval is a highly-respected facial plastic and reconstructive surgeon, and our team of paramedical aestheticians are have the expertise necessary to use laser tools skillfully and effectively. Patients like our comfortable, friendly office, too. IS THERE A SKIN TREATMENT JUST RIGHT FOR YOU? That depends. Because we can individually customize treatment plans and each treatment session, chances are very good that we can help you achieve your personal skin enhancement goals. So let’s talk. We’ll discuss your goals and options, using our Visia® Complexion Analysis technology to give you a deeper look at your own skin. But first, we encourage you to check out before and after photos, especially our own gallery of Raval Facial Aesthetics and Rocky Mountain Laser Aesthetics patients.